I'd read a brief mention in The 4-Hour Workweek that Ferriss got his first job out of college by emailing the CEO of a startup over and over until he got a position. I wanted to know the full story. "It wasn't just one-two-three and then you're hired," Ferriss told me. Toward the end of his senior year in college, Ferriss did his final project on that startup in an attempt to build a relationship with its CEO, who'd been a guest speaker in one of his classes. But, when he mustered the courage to ask for a job, he was turned down. Ferriss sent the CEO more emails. After the CEO said no a dozen times, Ferriss decided it was time for a Hail Mary. He emailed the CEO saying that he'd "be in the neighborhood" next week -- even though he was in New York and the CEO lived in San Francisco -- and said it'd be great to stop by. "All right," the CEO wrote back. "I can meet you on Tuesday." Ferriss got a standby ticket, flew to California and arrived at the startup's office early for his meeting. One of the other executives asked him, "So, you're not going to stop bothering us until we give you a job, huh?" "Sure," Ferriss told him, "if you want to put it that way." He got the job -- and, naturally, in sales. "It's important to note," Ferriss told me, "that I was never rude. I also didn't push the density. It's not like I emailed him six times a week." Ferriss's tone shifted, as if he was hinting at something, though embarrassingly, I couldn't figure it out. But, I could sense something was off because his tone was making my head snap back as if I was getting punched. "Where do you think that fine line is?" I asked. "If you sense someone getting annoyed, you need to back off." Jab. "You need to be polite and deferential and recognize that, if you're emailing someone like that, you should have your hat in hand." Jab. "There's a fine line between being persistent and being a hassle." Uppercut. If I had more experience interviewing, I would've dug deeper to uncover what Ferriss was trying to tell me. Instead I just fled to safer ground, looking down at my notepad in search of a different topic. "How did you gain credibility before you were a well-known author?" "Well, volunteering for the right organizations is an easy way to get some credible association," Ferriss said. His tone lightened and I relaxed. Ferriss explained that when he was an entry-level employee, he volunteered at the Silicon Valley Association of Startup Entrepreneurs where he produced large events, giving him a credible reason to email successful people. Rather than saying, "Hi, I'm Tim Ferriss, recent college graduate," he could say, "I'm Tim Ferriss, an event producer with the Silicon Valley Association of Startup Entrepreneurs." That legitimacy made a big difference. "A second step would be writing for or being featured in known publications," he continued. "And that could be as easy as doing a Q and A with someone -- interviewing them and publishing the answers online." In other words, Ferriss didn't build credibility out of thin air, but borrowed it by associating himself with well-known organizations and publications. The phrase "Borrowed Credibility" stuck in my mind. I know you're really busy and that you get a lot of emails, so this will only take sixty seconds to read. I totally understand if you're too busy to respond, but even a one- or two-line reply would really make my day. Ferriss was giving me exactly the kind of advice I craved. He told me to never email someone and ask to "jump on the phone," "get coffee" or "pick your brain." "And never write lines like, 'This is perfect for you,' or 'You'll love this because I know this-and-this about you.' Don't use superlative or exaggerated words because" -- he let out an almost mocking laugh -- "they don't know you and they'll assume, quite fairly, it's hard for you to determine if something's perfect for them. "And certainly, watch your frequency of emailing. Don't email a lot. It really" -- he let out a heavy breath -- "does not make people happy." I wasn't self-aware enough to see that Ferriss was trying to save me from myself. Over a year later, when I was rummaging through old emails, I came across the 31 messages I'd sent Ferriss's assistant. Only then did I realize how much of an idiot I'd been. "All right, man," Ferriss said as our conversation wrapped up. "I've got to go." He said goodbye and hung up. If I'd learned my lesson then, things would have gone a lot differently when I found myself in Omaha with Warren Buffett. 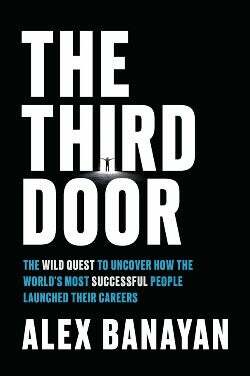 Adapted from The Third Door: The Wild Quest to Uncover How the World's Most Successful People Launched Their Careers. Copyright © 2018 by Alex Banayan. Published by Currency, an imprint of Penguin Random House LLC.